Valerie and Todd write, "Bentley was adopted in February 2002, and it took him a couple of months to really get comfortable in his new home. He has been completely spoiled with lots of toys, a huge kitty-condo that reaches the ceiling (he's showing it off in the pic), and tons of hugs and kisses. He sleeps with his mommy every night and gives her kisses on her hand in the morning, along with lots of kitty songs letting everyone know its time to get up! He has become a very good boy, although it did take some adjustment as he was a bit agressive when we first got him. That has really died down and we let him know that we love him and he has nothing to be afraid of. We've been very patient and it's paid off ! We are so happy to have such a wonderful, beautiful little boy!" 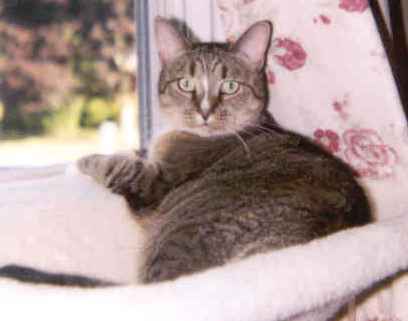 Whiskey was adopted in July 2002 by Carmen, who writes, "She's Daddy's Girl. When I can't find her, she's usually snuggled up to him somewhere. (You can see a white finger or toe hanging out from around him somewhere.. like this morning when I went looking for her and found her pretty white toes sticking up out of his bedding) She adapts quite well to snuggling up to me if he's not able to be home. Daddy calls her 'Slippers'. Hope it doesn't do any damage to her delicate psyche." 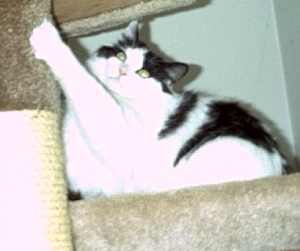 Tookie was adopted in July 2002 by Shannon, who writes, "Tookie is doing very well. He adjusted quickly and seems very comfortable as you can see.He and the bunny have become good friends and run around the house together. This is his favorite spot in our bedroom, he loves to look out the window. We are very happy to have him. He is the best natured cat and very lovable and he loves to cuddle. "Thank you again for all your help, we are enjoying his company so much and are very happy. He loves his new home!" 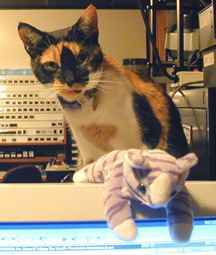 Pixel was adopted in October 1998 by Carolyn, who writes, "She's always been a mellow lady and continues to delight us with her very intelligent "presence."